The New Orleans Saints State of Technology. 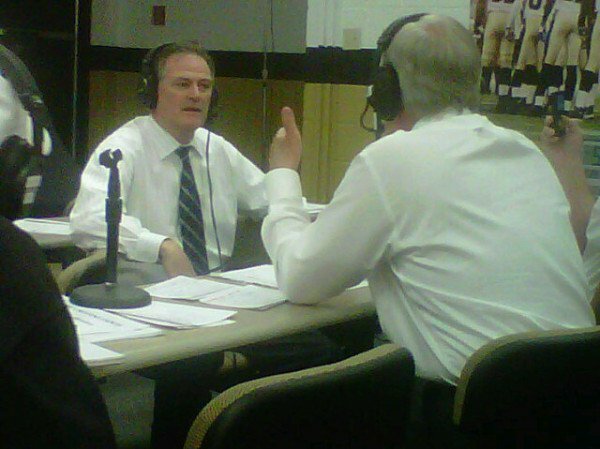 This is the second Sports Techie exclusive interview with Mickey Loomis, the General Manager of the New Orleans Saints, what an honor. Sports Techie and I extend our gratitude to Mickey for the opportunity to chat about Saints technology. Our ST blog with Mickey Loomis from last season can be read here: https://sportstechie.net/mickey-loomis/. Next up was fantasy football. I let Mickey know that I did not draft Drew Brees again this year. Mickey understands the popularity of these games for the fans and the league but is still not a player. Why would he, right. The NFL is his real fantasy football league as the Saints Executive Vice President and GM. After the recent NFL lock out ended, teams had only two weeks in which to get ready for the start of the 2011 season. I asked him how technology has impacted the Saints two week window of preparations? Mickey answered that they had their procedures and player performance systems in place and it really was not that much of a crunch for their organization. I was a 12th Man full of the spirit of 12 at the Seattle Seahawks “Beast Quake” upset win over the defending Super Bowl Champion Saints in the 2010 NFC Wildcard game played here in Seattle thanks to a ticket from fellow Sports Techie, Steve Caniglia. I shared that info with Mickey on the telephone with a hidden smile and then asked him if there really was an earthquake that occurred when Marshawn Lynch scored on his epic 67-yard touchdown in the 4th quarter? Mickey said that he was not all that for sure certain. Not a problem, Sports Techie. With the help of technology such as the old the Kingdome stadium sensors, we can view the actual Pacific Northwest Seismic Network seismic charts here via King 5: http://www.king5.com/news/local/Seahawks-fans-cause-12th-Man-quake-during-Lynch-touchdown-113208789.html. That was last year, however, this blog is about this year’s New Orleans Saints. Mickey was looking for ways to better organize and access the overwhelming amount of information NFL teams accumulate on draft prospects and pro players. All teams now rely on computers to store scouting information, and they have digital access to game videotapes. Still, there has been no way to bring it all together in a uniform, consistent and virtual way. The Saints are now on the digital path and use the I.C.E. Personnel Room Solution. The first in a platform strategy for sport operations centered on Interactive Content Evaluation or I.C.E. It was created with coaches and New Orleans Saints front office personnel, and STATS, LLC. STATS are the global sports statistics and information company known for providing statistical information to most sports league. 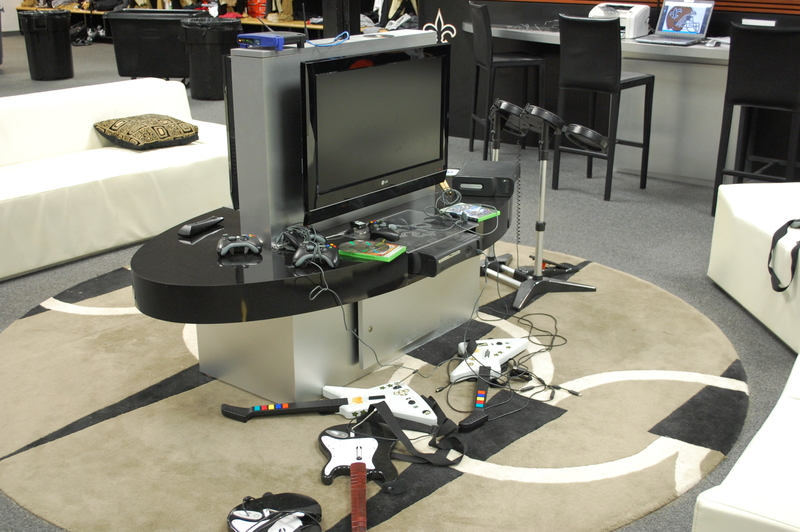 John Pollard of STATS, a former Microsoft software designer, created the system in 2009 after helping the Saints build an interactive lounge filled with Xbox controllers and computers for their players two years earlier. The picture below is via the Saints Doug Miller, Senior Director of Public Relations. I.C.E merges a teams assets, such as data, player reports, advanced video and analytical assets, through specialized data visualization and interactive technologies. Important salary information, medical reports, and personal information are available for the entire staff to interface with and utilize together throughout the season. This tech has given what Mickey feels is the most streamlined system possible for identifying, grading and ranking the best NFL prospects. The Saints first implemented the system in its beta form in 2009 to help build a Super Bowl champion team and Mickey is confident I.C.E. has given his team an evaluation competitive edge over other NFL franchises. Here is a link to the IdentityMine software N.O. 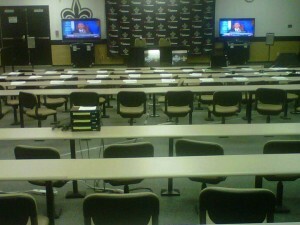 Saints Case Study video: Personnel Room – http://www.youtube.com/watch?v=aMn29y27spE&feature=youtu.be. The I.C.E. app has a natural user interface. It uses advanced motion graphics and visual content for Saints scouts, coaches and players to query records, analytics and media, in a single interface. The team can access digital info such as the Personnel Room, Scouting, Locker Room S.O.D.A. (Strategic On-Demand Analysis), or Classroom Game Planning. Saints scouts can download the I.C.E. player information into their smartphones and computers via USB, for instant access on airplanes or during a personnel or draft meeting. The system allows scouts to access ICE from their offices and take thumb drives on the road to plug into their laptops and mobile phones. When scouts are on the road looking at or testing, they’ll have all the information they’d have in the office, with robust, real-time access to each player. Scouts in draft meetings or grading prospects at college evaluations on their own, can quickly compare two players, including game videotape of specific game and practice situations. Tap on one player’s name to access his workout numbers and game tape, then repeat this action for the other. In a room with multiple monitors, you can compare players side-by-side for enhanced analysis. Most NFL scouting war rooms use magnetized name cards on a draft board on the wall. With I.C.E. 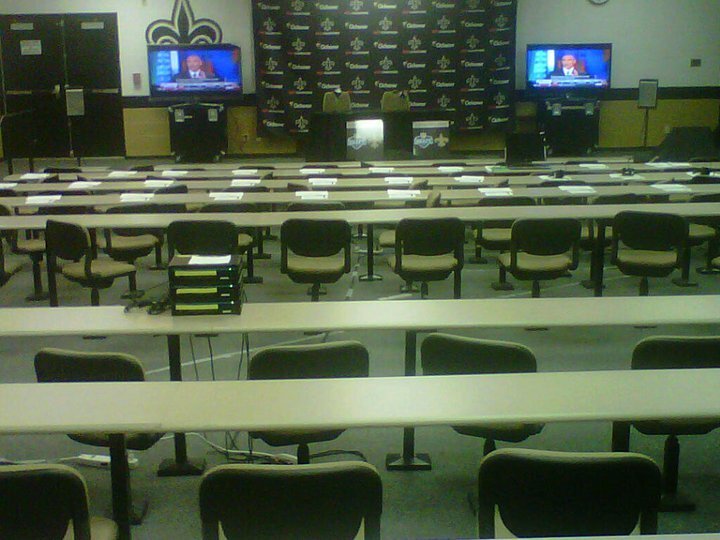 in operation, the Saints evaluation rankings will show up on large computer monitors in the war room, as well as personal computers, laptops and smartphones, all via cloud computing. Every draft prospect’s name is listed with his player grade, and with the touch of a screen, scouts and coaches can access all his collected information, with statistics often linked to their specific plays. Mickey is on record sharing the fact that the Saints have completed a few analytical studies. They wanted to know over the past five years how free agent deals have worked in terms of the performances of the players for their teams. Amazing that over a decade after my former employer Sports 2000 created the pioneering GridIron 2000 Expert System used by the Seattle Seahawks for game planning and analysis, I.C.E is the newest expert System that hopes to standardize and dominate football with their cutting-edge technology. “The GI 2000 is the path we are on with I.C.E.”, said Mickey. I followed up with a question to Mickey wondering whether their players have tablets such as the iPad synched to I.C.E., and if the Saints are using 3D? Mickey explained if tech can enhance the learning process, they are interested. There are no plans to use 3D this coming season but a custom app for a tablet might be coming by the 2112 season. A key feature during draft weekend is the easy removal and re-sorting of players on the digital board. This became especially important after they drafted Cameron Jordan with the 24th pick. The Saints then traded back into the first round and grabbed Mark Ingram at No. 28. The Saints traded their first-round pick in the 2012 draft and their second-round pick this year to the New England Patriots to select him. Ingram rushed for 1,658 yards in 2009, won the Heisman Trophy and led Alabama to the national title. So how did the Saints fare during this past NFL draft using I.C.E.? According to SBNation, the Saints earned an A. They just played the S.F. 49ers in the first preseason game and Head Coach Sean Payton said he watched film and was impressed with the “intensity level” and “energy.” I asked Mickey how you can measure these invisible traits watching film? Mickey said that with film, a players efforts can be gauged. They like to see players around the ball and those who are pursuing away from the ball, for example. The Coaches no longer draw up plays on the chalkboard and written down on paper, instead, with the help of technology, they automatically produce carded plays that are used at practice to help implement each weeks game plan strategy. Mickey stated that the goals with this tech are to be precise while offering descriptions and coaching points to the players. The NFL has new kickoff rules in place and after week one it seems like there will be many more touchbacks in the endzone by the receiving teams. I wondered how that went for the Saints vs. the 49ers after reviewing game clips? Mickey emphasized that, “it takes the players out of harms way.” Since there are three times higher occurrence of injury during a kickoff, it makes sense to change the play for the safety sake of the players. The Saints games are played in the covered Superdome and Mickey shared that it underwent another offseason renovation of $100 million after the original $200 million Hurricane Katrina fix up. He was excited about the stadium upgrades. Online at http://www.neworleanssaints.com/ the Saints are streaming the rest of their preseason games free of charge. You can take a 3D SuperDome tour. The NFL Play 60, Kids Club and USA football are continued partners with the Saints. Kids can also play online games directly from the web site. Many thanks again to Mickey for the 2011 update about Saints technology for Sports Techie.